The Hatchetfish comes from Amazonia. It is bets to keep these fish in small groups. They are surface fish that have the unique ability of “flying” short distances. A tight fitting cover must be kept on the aquarium. Care Level: The Hatchetfish is a relatively hardy fish once it acclimates to the tank. On a scale of 1 –10, (10 being easy) it would rate a “6”. Tank Conditions: Temperature 75 - 82°F; pH: 5.8 – 7.5. 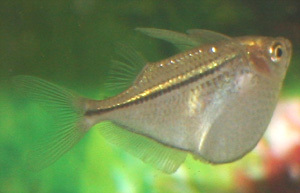 Description: The common hatchetfish has a convex body. The ventral fins are very small and the back is fairly straight. Pectoral fins are transparent and often measure up to one-half the fish's overall body length. The coloration is silver and the back is olive brown. The mouth is small and upturned. Depending on the angle of light, the colors can change from iridescent green to iridescent blue. A black vertical stripe extends from the gill cover to the base of the tail. 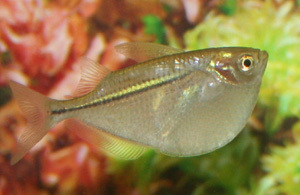 Temperament: Hatchetfish are small, peaceful, surface-dwelling fish. They are skittish and should only be housed with peaceful fish of lower swimming levels. Hatchetfish are schooling fish that should be kept in groups. Habitat: Provide with live plants, floating plants, rocks, roots etc. There should be gentle surface water movement. A tight fitting cover should be provided. Hatchetfish will jump from the tank. It is recommended to leave a 4-6" gap between the water surface and the cover. Compatibility: Hatchetfish in general can be kept with most other species that can handle the ph and temperature requirements. It is an active fish. It is best to keep in small groups.